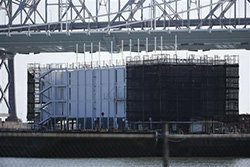 Google has gotten headlines lately for its mysterious barges, that prompted some to think Google was using offshore data centers or floating research labs. It turns out that the barges are actually upscale party venues and showrooms. The multi-story barges are made from stacked shipping containers. One is moored in San Francisco Bay and the other is in Portland, Maine. These are VIP, invitation only luxury showrooms for Google Glass and other new Google gadgets. The barges feature a top floor party deck, with bars, lanais and a lot more. The existence of these vessels came out a couple weeks ago, when CNET.com theorized that Google may have been putting together floating data centers that would house huge computer banks. Google got a patent for a water based data center in 2009. Google, now serving 25% of Web traffic in North America, is mum on this issue, and will not even acknowledge that it owns the vessels. But San Francisco city officials have confirmed that they have met with Google about the vessels this year. Google, which bought Bump this year, is trying hard to keep the vessels secret, complete with security guards and chain link fences. And at least one worker for the Coast Guard had to sign a non-disclosure agreement with Google. Google has stated recently that it is going to expand its $1500 Google Glass devices to more users. It has allowed a few early adoptors to buy test versions of Glass. It now will allow those people to invite three more people to buy it. These new barge showrooms could help Google to boost the buzz for Glass. The barges can be assembled and taken apart fast, and they can be transported by rail, barge or truck to many places, such as beaches or ski resorts.